The VIX remains under pressure, within the November bear trend, with the close below the July 2014 trendline putting pressure on the 10.28 year low of July 2014. Falling studies anticipate extension to psychological support at 10.00, with potential for further losses to the 9.70 year low of February 2007. 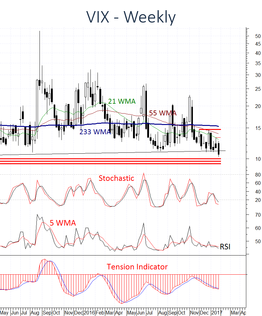 Still lower is the 9.39 year low of December 2006, but already oversold stochastics studies suggest downside tests could become progressively more difficult to maintain. Critical contract lows at the 8.89 low of December 1993 should underpin any immediate tests, as prices settle into volatile consolidation. Resistance is lowered to the 13.28 high of 19 January, but a close above the 14.72 high of December 2016 is needed to improve price action and promote stability/trend change.